when I lived in Florida (but not as good as Almost Home!). as it had some scratches and little blips here and there. The bathroom walls had beautiful wallpaper of birds and baskets of flowers. I worked with an artist back in the day of my re-design and room staging days. 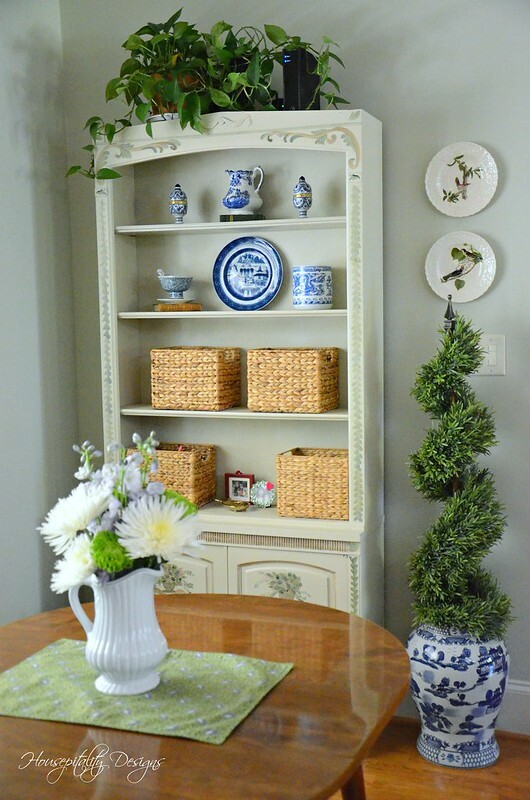 She painted the bookcase and added the designs from the wallpaper on to the doors. I cannot tell you how wonderful the bookcase looked in that bathroom against the wallpaper. 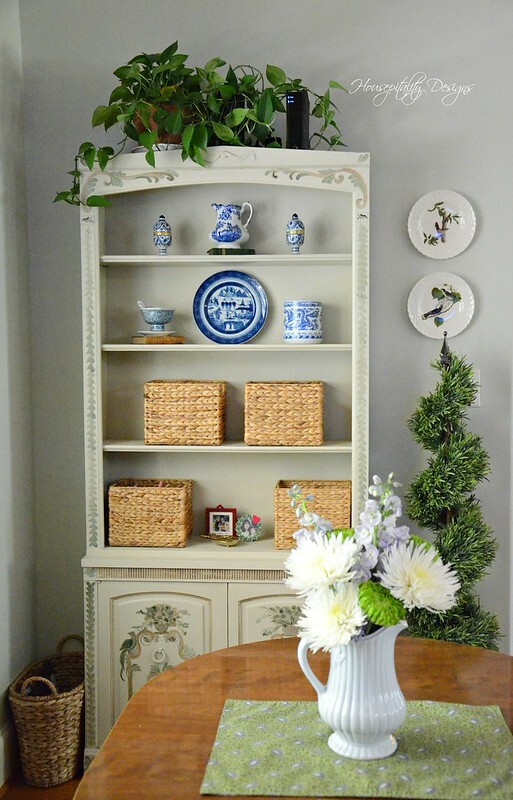 Now, that bookcase is doubling as a place for blue and white pretties and my office! address books, pens, markers, scissors and more! Everything I need tucked away in those baskets. 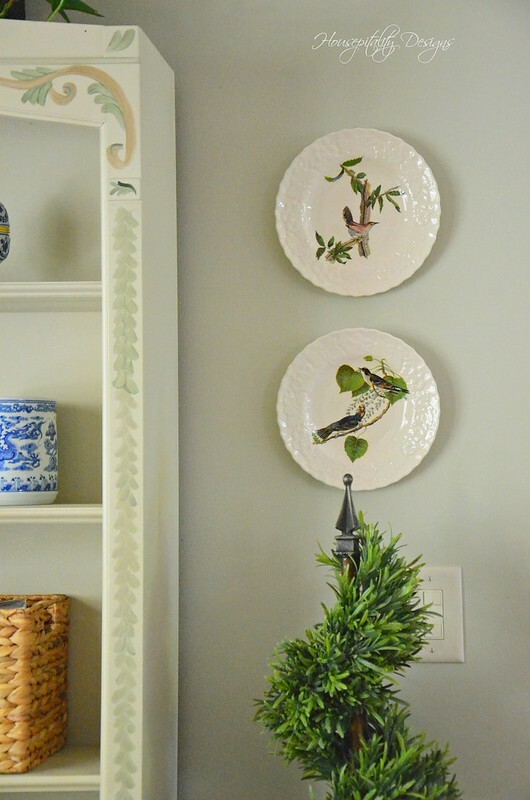 These vintage bird plates were also in the bathroom at my previous home. I should have named that house, so I could always refer to it by name. I already have a name for my next house. Once we break ground, I shall tell you what it is. On the floor on the left hand side of the bookcase is a tall narrow basket. That is my temporary “file basket” that also contains my “wall calendar”. Yes, I still love to see the month planned out on a large calendar, having lots of room to write. for the space next to the bookcase. I turned the breakfast room area in our former home into a sunroom. 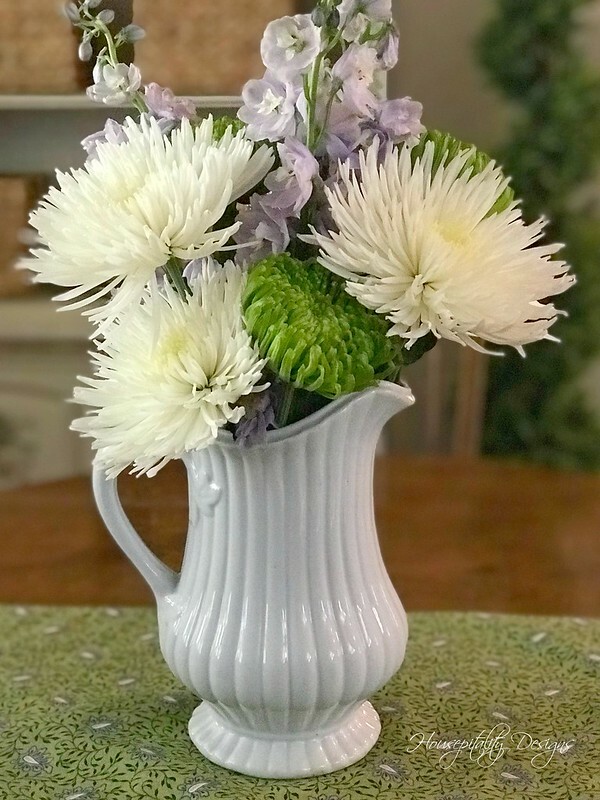 there were always plenty of flowers in the sunroom. So as we have meals at this table of ours in this breakfast room . . .
we think of how we saved and saved to get this table when we were first married. Our very first Ethan Allen purchase. It was a very exciting day waaaay back when . . .
when that small table and chairs were delivered. having a meal or creating a blog post or planning our new home. And we wonder . . . where have the years gone? to the booster seat ….. sitting at the table in a chair with us. Now my sweetie will sit at this table where her dad used to sit as a young boy and man. Treasured memories and more treasured memories to be made. Have a most beautiful day dear readers! AND while on the subject of Beautiful . . . The winner of the book Beautiful, by Mark D. Sikes is KARENANN !!! Congrats!!! I encourage you all to come back Wednesday for another fabulous new book review and giveaway!!! You’re making this place a pretty temporary home while building your next dream home. 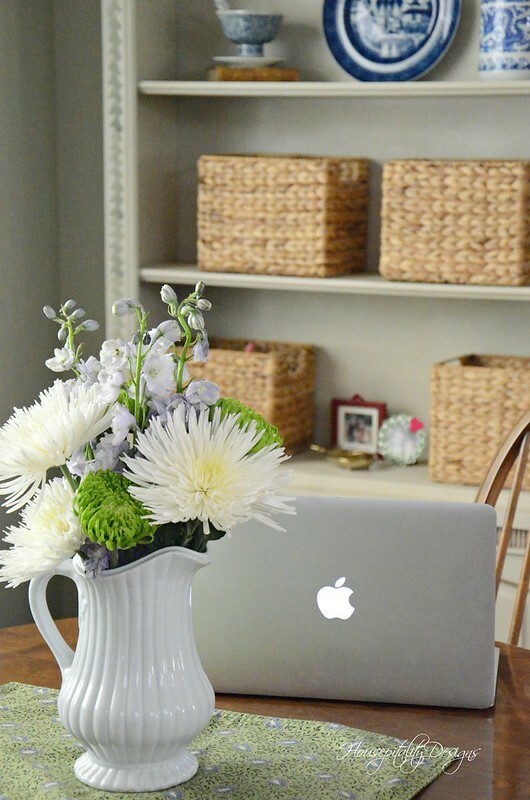 Your breakfast room/office is lovely. 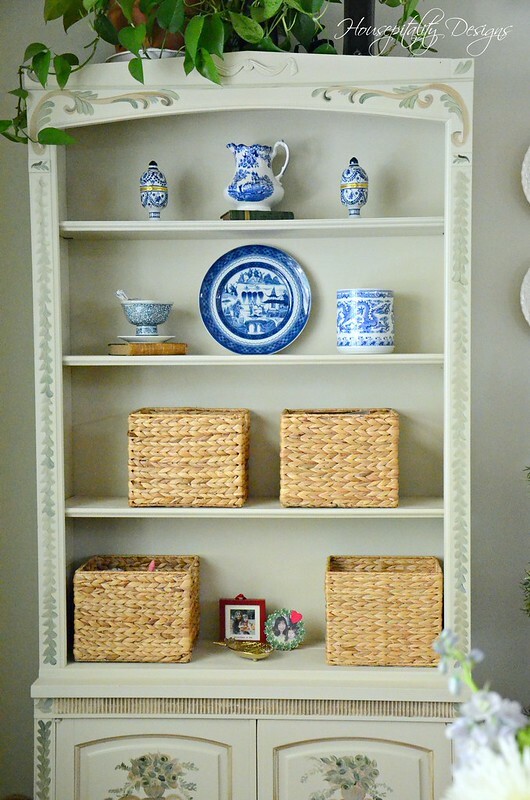 Love the book case and how you used baskets as storage. Your breakfast area is beautiful, Shirley! 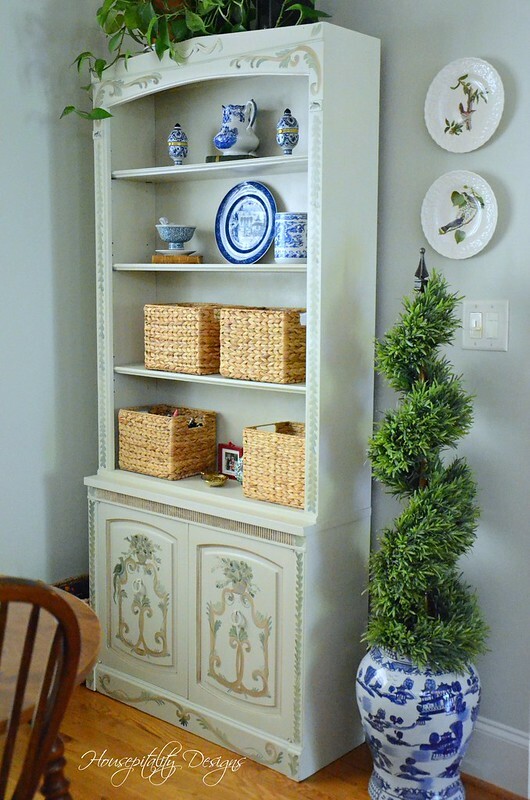 The bookcase is so pretty with the blue and white pieces, and the antique bird plates flanking it are perfect! Enjoy your day, sweet friend!!! You made the room cozy and and inviting to enjoy until you’re new home is ready. I’m still trying to find a name that fits my current house. Oooh, Shirley! 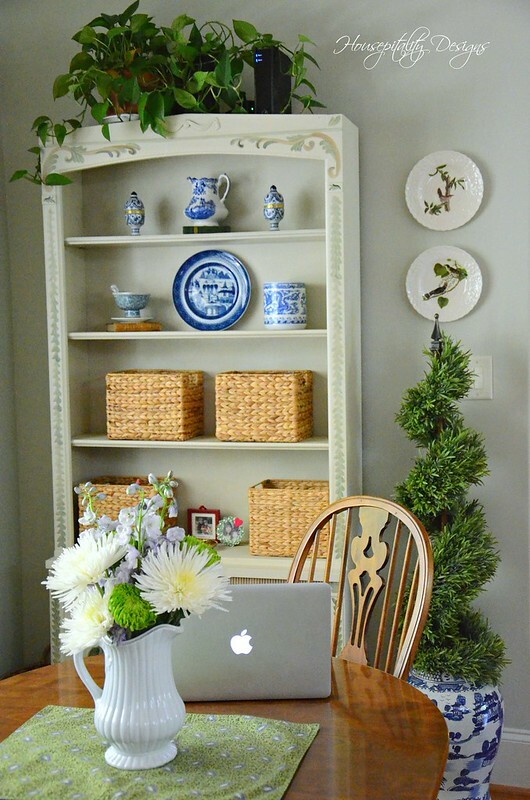 I very much like this space and how you’ve multi-purposed it, particularly with use of the baskets for the normal office things. The Drexel bookcase is a keeper! Have a great week, and congrats to Karenann! Shirley you have moved! It has been ages since I have been blogging hoping and when I stopped by you have moved and are going to build a wonderful new home! Good for you! I know that it will extra amazing because you are so talented! I’m looking forward to your up coming posts. Love, love, love the bookcase. The painting on it is just beautiful and of course it is beautifully decorated. Have an amazing week! Love the Drexel Heritage bookcase- the artist’s work was a beautiful addition. Isn’t it sweet to reflect on those moments like getting your first Ethan Allen dining set! I remember events like that oo. Having my grandson visit recently made me feel very reflective. All those milestone like the high chair to a booster chair….each one an achievement for you and him. 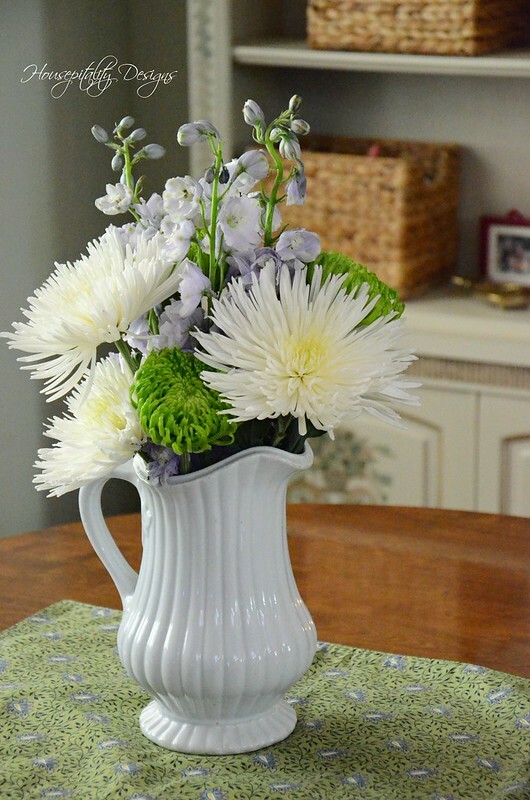 The flowers are so pretty- love mums! Cheers to planning for your new home! So nice to have a workspace with so many memories, is functional and pretty all at the same time! I agree with JoAnn, when you are sitting there you have all those memories to make it even more special! 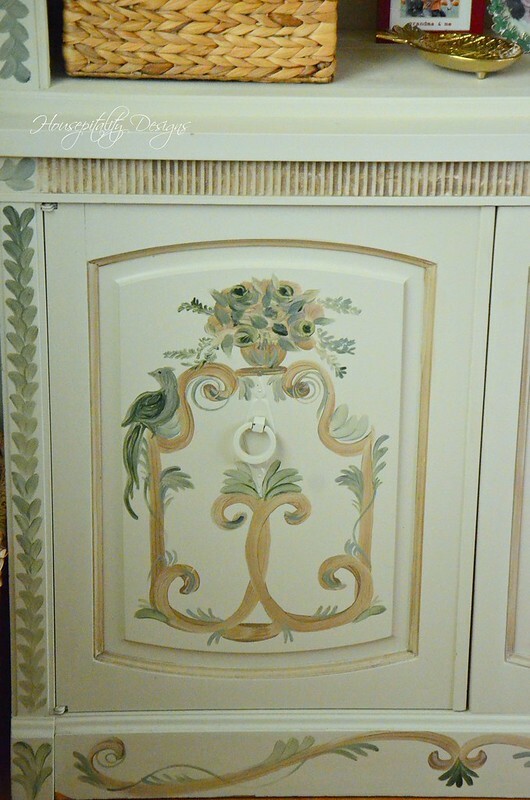 I love the bookcase, it is so beautiful with the painting on it and the bird plates are beautiful as well. I think I may try getting a couple of baskets for my desk here. I like that idea, right now my desk makes me crazy trying to keep it neat. Have a beautiful week and congratulations to the winner of the book!!!! I think I will order a copy for myself. It sounds wonderful. Hi Shirley! I’m so happy to see that you really are getting settled in and it looks like you! Isn’t it wonderful that you have things that bring back sweet memories? We do too and wouldn’t trade them for anything. Thanks for sharing this post with us. I am little bit interested to get more information about chair.I like to share my opinion on chair.Chairs have been round for hundreds of years, and solely hold getting higher. With the incorporation of recent supplies, expertise, and ergonomic design, chairs should not solely wanting higher, they really feel significantly better. Shirley, you have created a beautiful multi-functional,space. 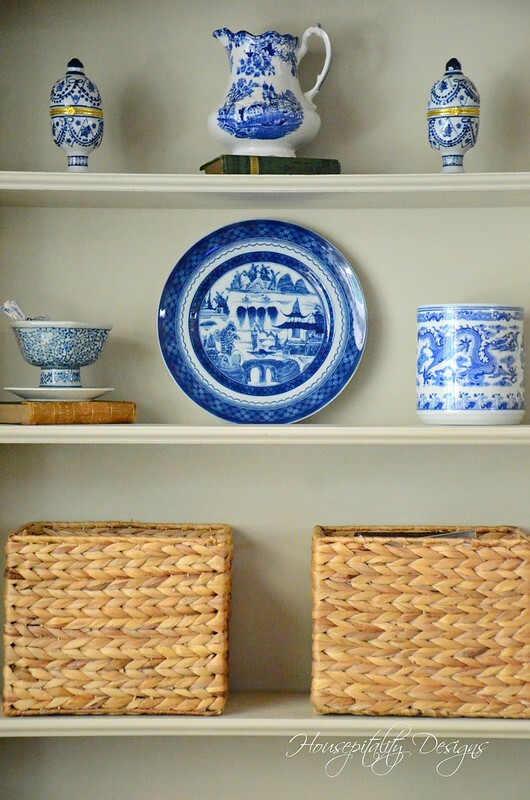 The DH bookcase looks so pretty with your baskets and your blue and white. I must say, I love the vintage bird plates. Thanks for sharing your sweet memories. Love that bookcase in it’s new space. Time is going by way too quickly and now you can make some new memories around that special table. Hope you break ground soon!